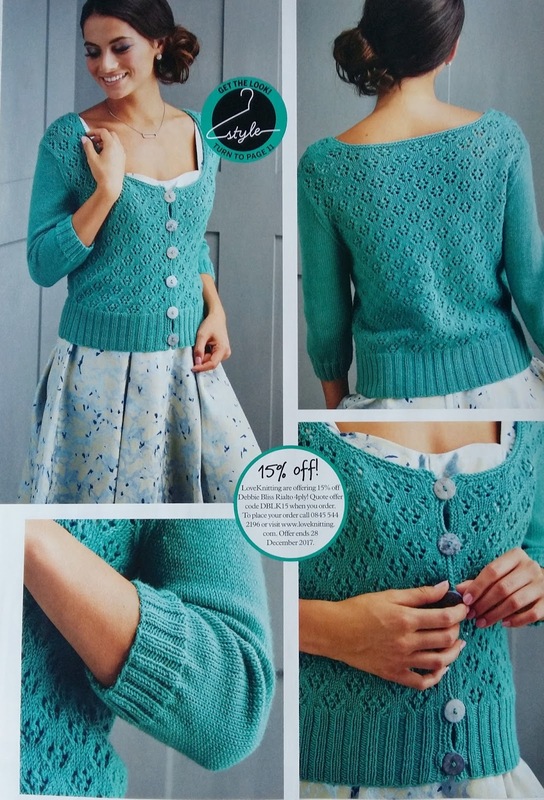 Issue 167 of Simply Knitting features a lace cardigan designed by me. The cardigan is knitted in Debbie Bliss Rialto Lace and is perfect worn with a pretty dress or jeans. A simple lace pattern is teamed with a deep rib and stocking stitch sleeve for a contemporary cardigan. The Knitter says: 'Throw this elegant cardigan on over your favourite party dress to bring the whole outfit together. Use a striking extra-long hem to frame the easy-to-knit lace pattern. Add contrasting stocking stitch sleeves to keep the attention on those lacy stitches, and finish the entire look off with a set of delicate shell buttons'. This pattern comes in sizes 8-10, 12014, 16-18, 20-22 and 24-26. See the magazine for measurements and more details about sizing. Simply Knitting issue 167 is in the shops in the UK now.